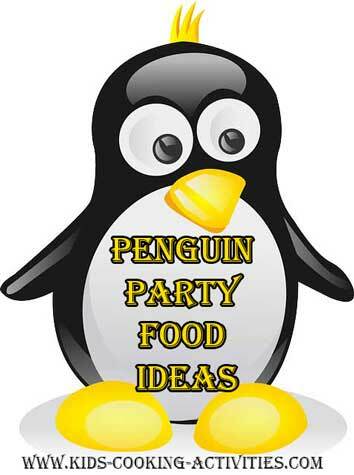 These penguin party food ideas include several eatable penguin recipes that kids will enjoy creating. Create a whole penguin scene and let the kids design a dinner invitation or menu for the night. Do your kids have stuffed animal penguins? Use them for decoration. Create an igloo for the centerpiece and add toy penguins, polar bears and other animals that fit with the scenery. Use the penguin recipes you create below for your centerpiece. 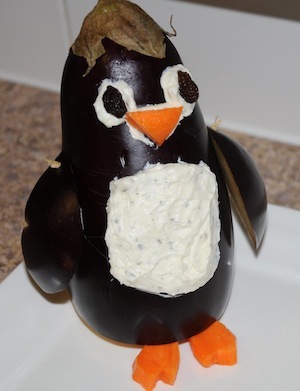 To prepare your penguins, Cut one black olive in half for his flippers. 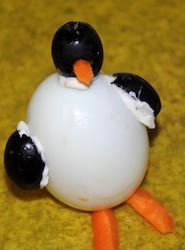 Attach flippers to the egg by adding a dot of cream cheese to each olive half. Place on sides of egg. For the head, add cream cheese to the bottom of a whole olive and place on top of egg. If having problems staying on attach with a toothpick. For his feet, use slivers of carrot sticks and attach on into his olive head for a beak as well. If needed poke a small hole with a toothpick for inserting the carrot nose. 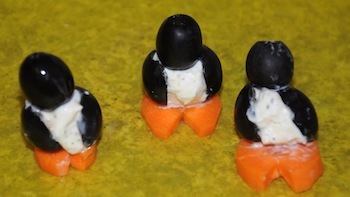 For these littler penguins I've used a simple cheeseball recipe. However, do not roll in nuts. Then make cheese into small balls and chill several hours or until firm. 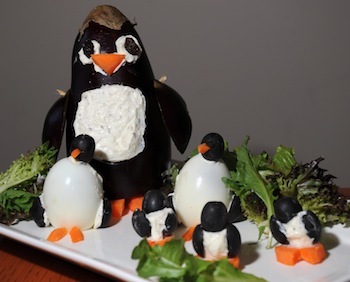 To create these penguins, cut one black olive in half for the flippers. Attach to sides of your small balls. If needed, use soft cream cheese to help the olives stick. Cut a small notch out of carrot circles and place a dot of cream cheese on top. Place a penguin on the cheese and press into place. For his beak cut out a small piece of carrot from a carrot stick and attach inside a whole olive for his head. Add a dot of cream cheese to the top of his body and attach head to body. If needed use a toothpick to secure in place. This is the easiest penguin and the cutest!. 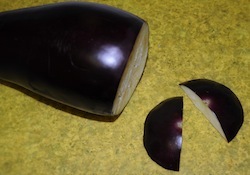 First you will need to cut off the end of an eggplant and then cut into two halves for the flippers. With toothpicks press eggplant halves into sides of eggplant. Spread dip over the middle of the eggplant to create a white belly. Add two circles of dip on the top for eyes and place two raisins in the middle of the white circles. Add a dot of dip to his carrot beak and attach below the eyes. Cut carrot stick into feet and place under the eggplant. This would be a great centerpiece for your party! Cut cod or tilapia fish in strips. Crush cornflakes and season with salt and pepper. Dip each strip in lemon juice and then coat each strip with cornflakes. Place on a cookie sheet. Cook at 475 degrees about 8-10 minutes or until cooked through. Use some fish ideas such as a pizza fish from our under the sea theme.